Cottage pie is another one of those staple meals that somehow manage to keep these cold winter nights at bay. It is a meal that I used to make fairly regularly at university as it was affordable and could easily feed a large number of people. It is what I would describe as wholesome food – it gives you a good dose of protein, vegetables and carbs. It is a meal that could very easily be prepared in advance and stored in the fridge for cooking later in the week. It is definitely a meal to keep in mind during these winter months as it is another one of those comfort foods. Place the onions and garlic in a pan with a little oil and allow to soften. Add the meat and cook stirring occasionally until it has browned off. Add the carrots, tinned tomatoes, tomato puree, beef stock cube, herbs, half of the ketchup and the Worcestershire sauce and season well. Allow the sauce to bubble away and reduce slightly for 20-30 minutes. Then taste and add more ketchup, Worcestershire sauce and seasoning as necessary. Whilst the sauce is reducing start making the potato topping. Place the potatoes in a saucepan with some salt, cover with water and bring to the boil. Leave to simmer until potatoes are cooked (to test see if a knife passes through the potatoes easily). Drain the potatoes and put back in the saucepan. Add the milk, butter and seasoning then using a potato masher, mash the potatoes until they are smooth. 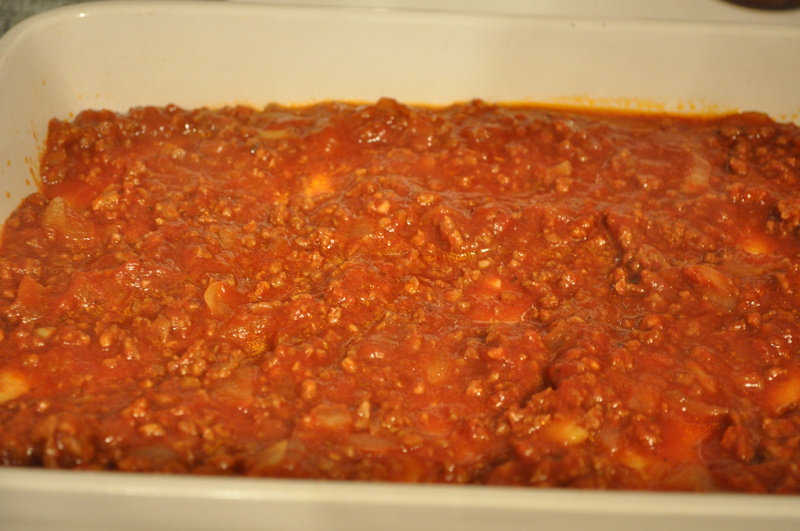 Place the meat sauce in a deep ovenproof dish. Then carefully cover with the mashed potato and create a swirly pattern using a fork. Finally top with some grated cheese. Place in the oven and cook at 180C fan for 30 minutes. Remove from the oven and allow to cool for 5-10 minutes before serving with the vegetables of your choice. This entry was posted in beef, cheese, main meal, recipes and tagged comfortfood, familyfavourites, food, instayum, recipes, winterwarmers on December 11, 2012 by Antonia Cooks. The weather is truly miserable at the moment, it is cold and rainy and it doesn’t make me want to go outside very much. 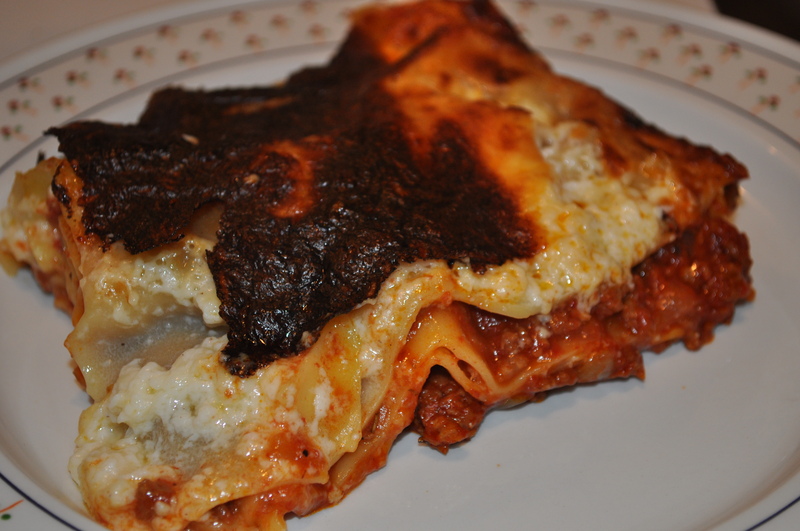 It is the perfect weather for enjoying a lasagne, another of my comfort foods. The recipe below is our family recipe that I have been using for years. It is everything you want from a lasagne – a meat sauce between layers of pasta and a creamy cheese sauce. 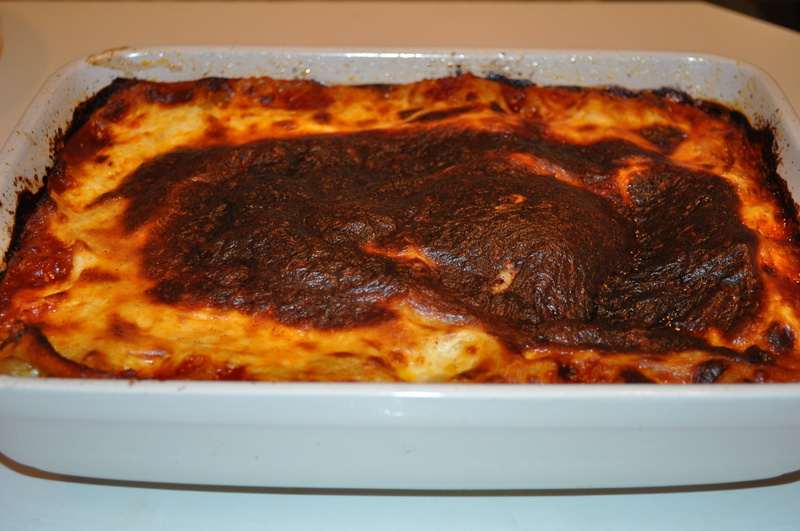 For some reason lasagne reminds me of my university days. I think this is because it is an affordable dinner party option that was always comforting and guaranteed to go down well! Whilst I have been living in France I have been experiencing issues with the pasta bought locally not cooking properly which I think this is down to it containing a lot of starch. Consequently, I have had to soak the pasta sheets before putting them in the lasagne rather than just putting them under the tap which I would normally do, which seems to have resolved the problem of excess starch. As a family we tend to enjoy the lasagne with a big tomato and red pepper salad or coleslaw. If I am feeling particularly indulgent I sometimes serve garlic bread as well. Place the onions and garlic in a frying pan with a little oil, cook for 2-3 minutes. Add the meat and allow it to brown off. 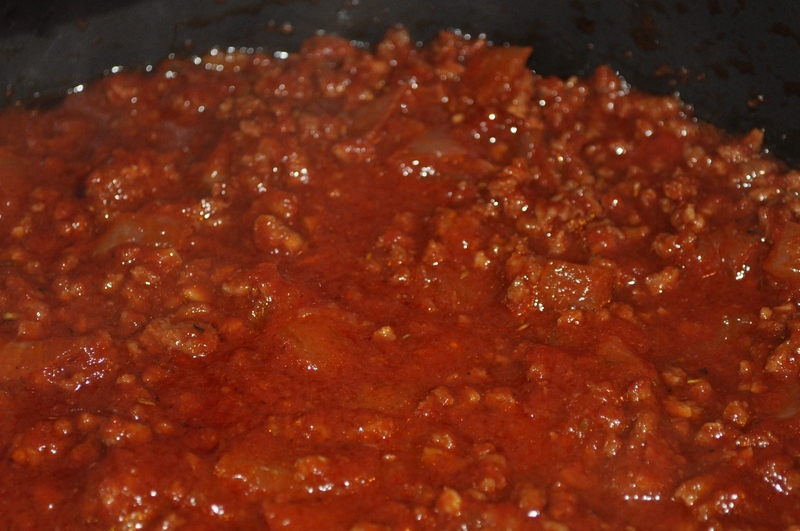 Once the meat has browned off add the rest of the ingredients and allow to simmer for 15-20 minutes. Slowly add the milk a little at a time, stirring continuously to avoid lumps. Add the nutmeg and season with pepper. 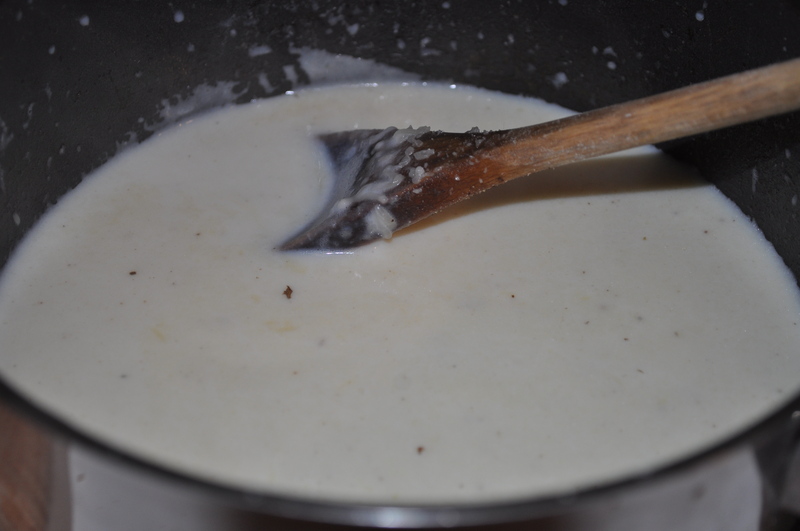 Once the sauce has thickened slightly add the cheese and stir until it is melted. 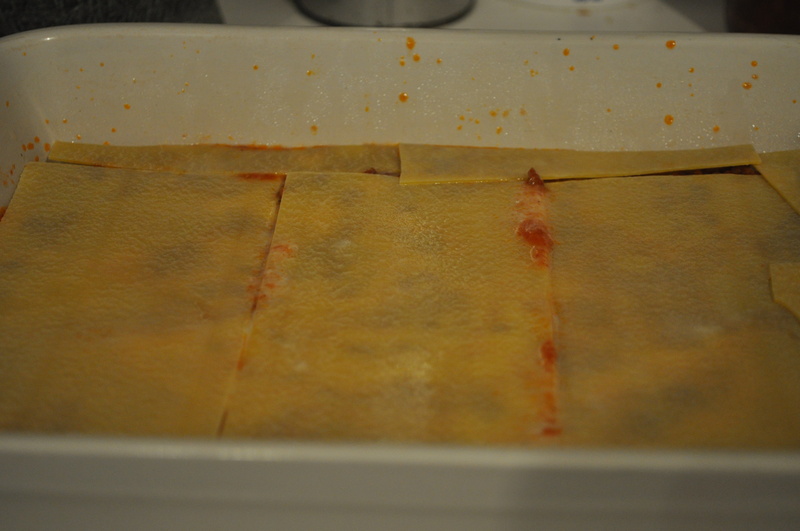 Soak the lasagne sheets in warm water for a minute or so to remove some of the starch and allow them to soften slightly. Topping – scatter over the cheese and grate over some nutmeg. Place in oven and bake at 180C fan for 30 minutes. Serve with coleslaw, a salad and/or garlic bread. Enjoy! This entry was posted in beef, cheese, main meal, pasta, recipes, sauce and tagged comfortfood, familyfavourites, homecooking, instayum, pasta, recipes, winterwarmers on November 28, 2012 by Antonia Cooks. Ages ago a friend had been telling me about a soup that she had bought for lunch one day that tasted amazing. Apparently it was a tomato based soup containing both spinach and chickpeas. Having harvested a large crop of spinach from the garden last week I decided to do my interpretation of the soup as I knew little else other than those three ingredients. Earlier in the year we froze huge quantities of tomatoes that we had peeled and roughly chopped (having removed the tough core and any blemishes). So, after raiding the freezer and de-thawing the tomatoes I was able to make the soup. I found the spinach gave it a slightly earthy taste whereas the chickpeas added a slight bite and texture. The Moroccan spice mix known as ras-el-hanout (a handy thing to have in your cupboard for flavouring couscous or lamb) gives the soup real warmth and honey stops it becoming too overpowering. 1. Fry off onions, garlic and ras-el-hanout in a little oil. 2. 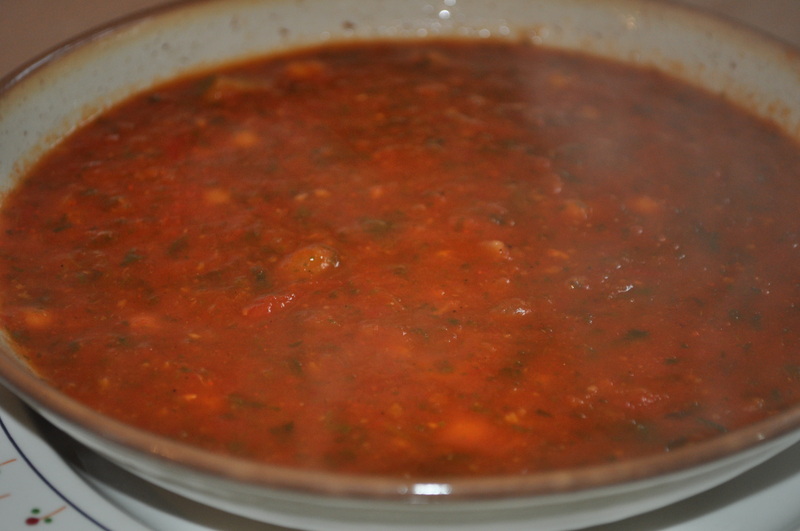 Add the tomatoes, chickpeas, stock cube and half of the honey and cook for 10 minutes. 3. Taste the soup and add the rest of the honey (as required) and season well. 4. Add the spinach, cook for a further 5 minutes. 5. Remove from the heat and semi-blend the soup using a handheld liquidiser. Serve hot with a little French bread. This entry was posted in main meal, quick & easy, recipes, soup and tagged eatclean, healthyeating, recipes, soup, spices, winterwarmers on November 26, 2012 by Antonia Cooks.